BackupWorks has decided to extend the successful RDX "Free Docking Station" promotion through September 30, 2011. Buy 3 or more of the Imation RDX Cartridges - 160GB, 320GB, 500GB, 640GB, 750GB or 1TB and receive a FREE RDX USB 2.0 Docking Station. Purchase 3 or More Imation RDX Removable Disk Cartridges and Receive a FREE Imation RDX External USB 2.0 Docking Station. Get an RDX Docking Station FREE! For a limited time, BackupWorks makes it easy to get a FREE docking station with your purchase. Buy 3 or more Imation RDX removable Disk Cartridges and we'll give you the Imation RDX USB 2.0 Docking Sation absolutely FREE! Hurry, this offer only lasts until September 30, 2011. Q: What is the BackupWorks Imation RDX Promotion (July 5, 2011 - September 30, 2011)? A: Purchase 3 or more Imation Disk Cartridges and receive a FREE Imation RDX External USB 2.0 Docking Station. A: The Promotion is effective from 12:01am, PST, July 5, 2011 until 11:59pm, PDT, September 30, 2011. ALL ORDERS MUST BE PLACED BY September 30, 2011. NO EXCEPTIONS. 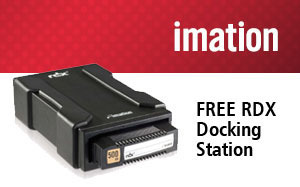 Q: What Imation RDX Disk Cartridges are eligible for the FREE External RDX Docking Station? A: Order 3 or more Imation RDX disk cartridges and we will revise you order to include the FREE docking station, or call their BackupWorks Rep at 866 801 2944. Q: Is there any limit to the number of Disk Cartridges that the Customer can order with the Promotion?